Yesterday I attended a workshop for the pipe bands in the Wasatch Front. I had a great time and it was really good to just hang out with members of the other area bands. The highlights were a piobaireachd class I took with local pipemaker and teacher, Gordon Nichol, and then later, the instructors’ recital. Gordon has taken the initiative (along with some others locally) to found the Utah Piobaireachd Society. I missed their first meeting back in November, so this was the first time I had met him. He seems like a really nice guy – knowledgeable, but unassuming – and clearly has a great love of the music. It turns out he also teaches some of the younger members of my band, and he offered to give me any help I needed. At the recital Gordon played The Desperate Battle, despite some rib pain, which he said was bothering him. I certainly didn’t notice. It was also really good to hear our band instructor, Justin Howland, play some of his competition tunes. You’ve got to feel good about being in a band with an instructor of that caliber – Justin sounded just tremendous. Of course, he would probably disagree, but the whole day sure made me feel good about having access to this level of help with my piping. Exciting news! Ross Anderson of Cambridge University, together with Roderick Cannon, has scanned a full copy of a heretofore unpublished Donald MacDonald manuscript. MacDonald published the first collection of piobaireachd in 1820 and was working on a second collection. This is the draft of that collection. Anderson and Cannon have generously made the manuscript public and here it is. I have peeked at a few of the pages, but it is going to take a while to look at the whole thing. There are 282 pages! From what I have seen, though, the quality of the images is good and the notation is also very clear. It would not be difficult at all to play from this manuscript. Thank you, gentlemen! Check out the conversation that I started on the Bob Dunsire Bagpipe Forums. There are a few interesting comments. I will continue to provide input for the thread and we’ll see where it goes. Dae you hae a guid Scots tongue in yer heid? To clarify, my brother sent me a CD of pipe music and he had to order it from the Scots Language Society, or Scots Leid Associe. The society exists to promote the use of the Scots (not gaelic) language. To my ears, it sounds like the old people I heard when I lived in Bo’ness and Falkirk in West Lothian, although, according to those people, they were speaking a specifically local dialect peculiar to their own town. I remember two of my friends (both in their 40s) who had lived their whole lives in Bo’ness having a conversation in front of me using all the dialect words they could think of. It was largely incomprehensible. My brother said that when he ordered the CD, he spoke to John Law, who edits the official Scots Language magazine. He was “a friendly guy, but hard to understand”. Perhaps I will call him sometime. The CD is tremendous – Andrew Wright playing piobaireachd, including two tunes that I hope to be able to play soon: Hail to my Country, and The Lament for Captain MacDougall. My old band, The Celtic Spirit Pipe Band used to play the first variation from Hail to my Country, and it’s good to hear the whole tune being played. 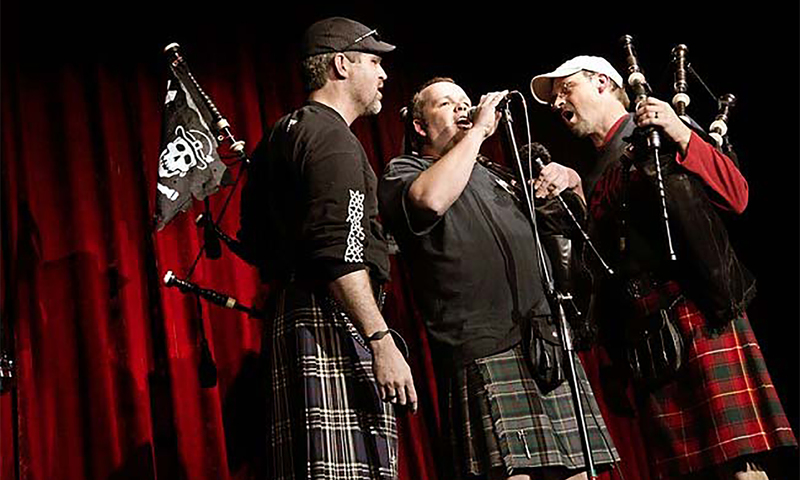 Check out my old band playing and then take a look at the Scots Language Society’s CD offerings. They have stuff you won’t find anywhere else. We visted some friends yesterday. They showed us a math movie about fractals and the Mandelbrot Set. Sounds dull, but these things are actually very beautiful. One of the talking heads interviewed defined a fractal as a form, which no matter how many times it was magnified, always contained a further level of fine detail. Furthermore, the details look rather similar, but not necessarily identical at any level of magnification. The classic example of this is called the Mandelbrot Set, which looks rather like a bug, but on further magnification reveals startlingly beautiful detail. The mathemusician in me immediately thought of piobaireachd. A simple tune, but the further you play, the more complex it becomes. Of course, the tunes end and fractals never do, but I like how formulaic and yet random both are. I’m sure I’m not the first person to notice this. I think I will post on the piping boards and report back. OK, everybody. Now I have the music to I Am Proud to Play a Pipe. Step 1 Complete. Next I have to listen to it a lot – I have Bagpipe Player software to help me with that. And I have to try out some of these strange cadences and grace notes. At the outset it almost seems as though I will need a different mindset and even a different pair of hands to play piobaireachd. The whole thing is so different from light music. I will tap the talent from the Piobaireachd list on the Bob Dunsire forums. Piobaireachd – get it while it’s hot. Any serious Ceol Mor fans should check out the BBC Radio Scotland Pipeline show for this week while they still can. It features Murray Henderson playing “Lament for the Harp Tree” at the Northern Meeting. This tune may not be the longest, but it has to be a contender. I timed it at 25 minutes and change. Anyway length apart, it’s a very beautiful tune, and Murray’s bagpipe stayed in great condition throughout. You have until a week from tomorrow to listen. Then the BBC switches to the next edition of the show.